Nowadays, the stakes are growing increasingly high with the play-offs in 2014 FIFA World Cup Brazil beginning to shape our hopes for the global winner. 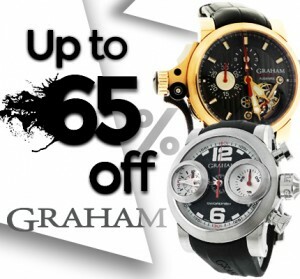 Hence, the luxury watch brands have also managed to grasp the spirit of the 2014 world’s championship, and created a series of luxury watches designed specifically for the World Cup’s fans, sponsors, and participants – everyone with a passion to football and wishing to commemorate it in luxury accessories such as high-end watches. The official timekeeper of the 2014 FIFA World Cup Brazil is Hublot, a prestigious luxury watches producers having a long history of collaboration with prestigious, world-famous sporting events. 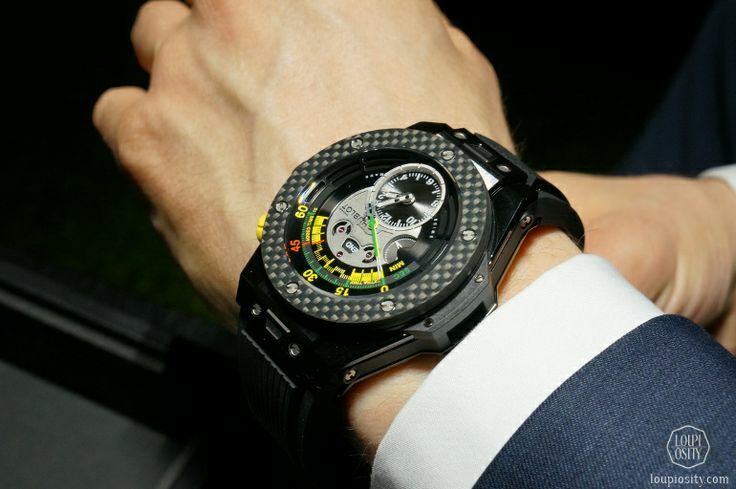 Much was done by Hublot to make this championship unforgettable, including the design of the huge Hublot Official Countdown Clocks made by the Brazilian architect Oscar Niemeyer, and the design of a new model of Hublot luxury watches – Big Bang Unico Bi-Retrograde Chrono as an official watch of the 2014 FIFA World Cup BrazilTM. However, it was not the privilege of only Hublot to make luxury watches dedicated to this championship, though official sponsorship was obviously exclusive. 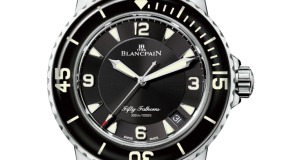 This way, many other luxury watch brands like Bulgari and Tissot have also taken the lead of Hublot and created prestigious watches in their 2014 collection resembling the colors, style, and spirit of the FIFA championship. One of such Tissot’s models is called Tissot Quickster Football – this watch us made with proper regard to the timing of a football match, and there are several models of this product line designed in tune with jersey uniforms of different teams. The stylish engraving of a football is presented at the caseback of this watch, making it a perfect fit for fans of this sport. 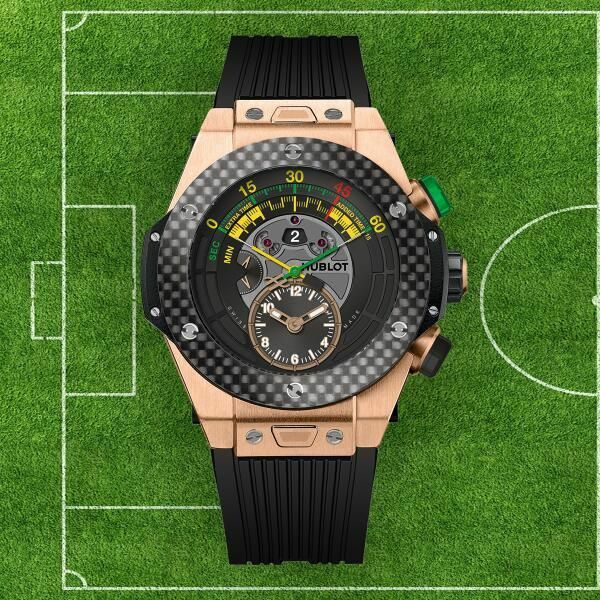 Obviously, not mentioning the official timekeeper of FIFA 2014 is impossible in this article. This watch is designed with the use of yellow and green colors, national colors of Brazil. 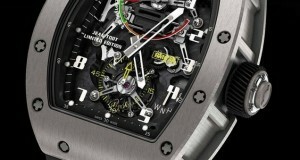 This model is also equipped with 6 famous H-shaped screws of Hublot luxury watches. Moreover, this watch has a golden case with a carbon fiber bezel, and this whole beauty and luxury is accomplished with black ceramic. There are two types of Hublot luxury watches produced in limited numbers for the 2014 FIFA Championship: the golden case models equal 100 pieces, while black ceramic watches with a carbon fiber bezel account for 200 pieces of that collection. Finally, the Bulgari luxury watch brand has distinguished itself from many other prestigious watches producers by manufacturing a FIFA World Cup watch model. A gorgeous, posh model of Bulgari’s Octo Bi-Retro Brazil collection is impressive and unforgettably stylized with the blue, green, and yellow colors of Brazil’s national flag. This watch is equipped with a bi-retrograde display for minutes, and a date window in the lower part of the dial. These watches were released as a 50-piece collection, so all fans of football attributes should be quick to buy some samples for this specific event.